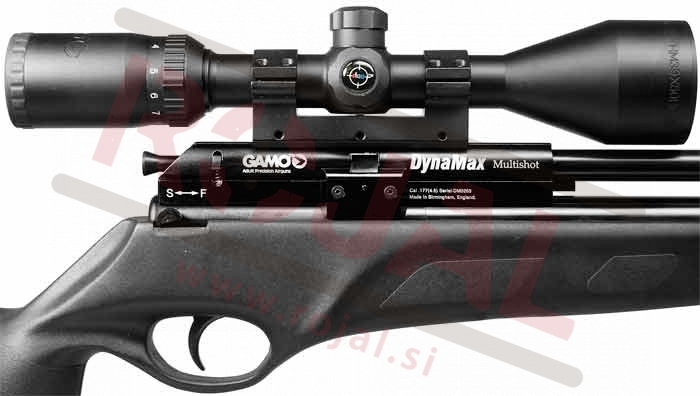 Dynamax is the first PCP rifle by GAMO which was introduced back in 2010 in 4.5 caliber. 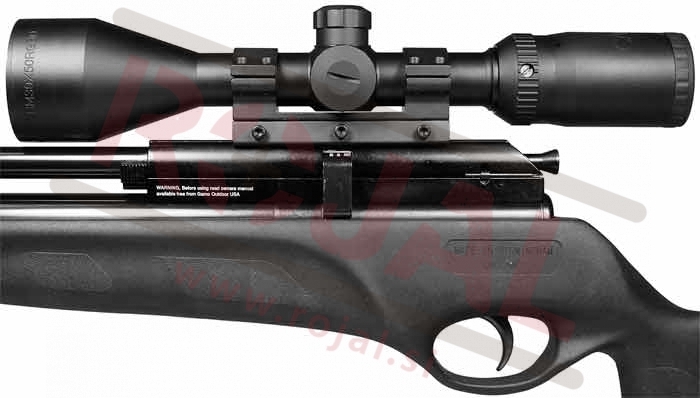 It now comes in 5.5mm caliber which is more suitable for precise shooting at longer distances. As you probably already know, PCP guns are known for no recoil or vibrations which makes them perfect for what they are intended- shooting. It uses air for operation which is compressed to 220 bar. The air forces the diaboles through free floating 52cm long barrel which has a nice compensator finish at the end. They say that this gun is actually the definition of free floating barrels because it has only about a centimeter of clearance between itself and the air reservoir. Realisticly looking the gun is capable of pushing a 1 gram diabole with speeds up to 300m/s at good weather conditions. This information tells us that by choosing ta heavier type ammo, the speed falls to acceptable 230-250 m/s which is optimal for accurate shots and maintaining the kinnetic energy at distances 50-80m. DynaMax has plenty special characteristics. The stock has obviously designed by a man who knows what it takes for a stable grip and excellent firing conditions. This particularly shows in the natural stock posture with rised cheek piece and thumb rest. The trigger is 2 level and adjustable. Rotation 8 diabole magazine is practically hidden in the gun which adds up to the visual image of the gun. The gun comes without optics and has a platform for 11mm "Dovetail" rails. The purchase of this rifle is possible with an ID of a person that is at least 18 years old. If you are ordering over the interent, please send us a both sided copy of your ID.